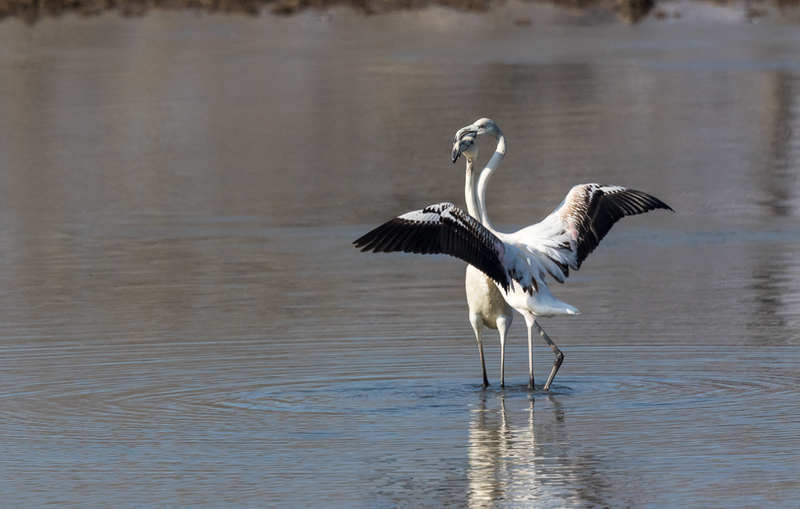 The inspiration going to Greece came following my purchase of the great book "Dalmatians and Other Pelicans" by the Swedish wildlife photographer Brutus Östling. 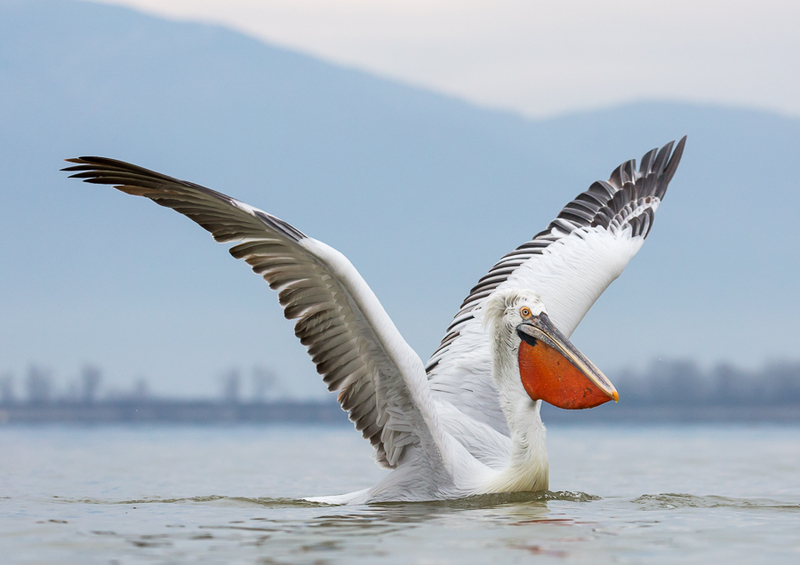 Stunning and colourful images were unfolded in the book about Dalmatian Pelicans from Lake Kerkini and I began considering a trip of my own. A search on the internet revealed that NaturesLens in the UK offered a trip in January 2016 and I decided to make a booking - it turned out to be a very wise decision! Full of anticipation, I travelled to Thessaloniki via Athens on 15 January 2016 and arrived at hotel Oikoperiigitis in Kerkini early in the evening after driving some 100 km in my rented car. Here, I met with David Miles from NaturesLens and the Greek guide Vasilis and the group of five more photographers. 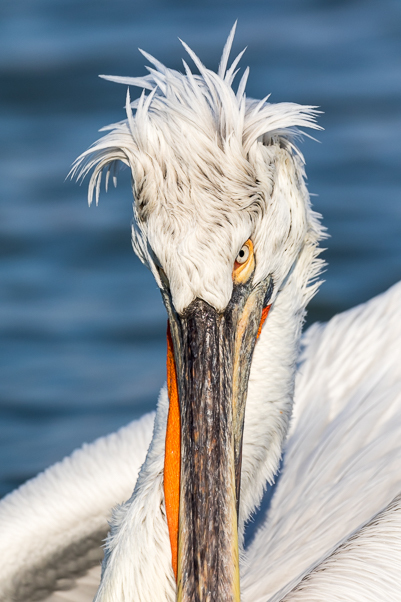 Next morning, I was going to experience my first Dalmatian Pelicans. 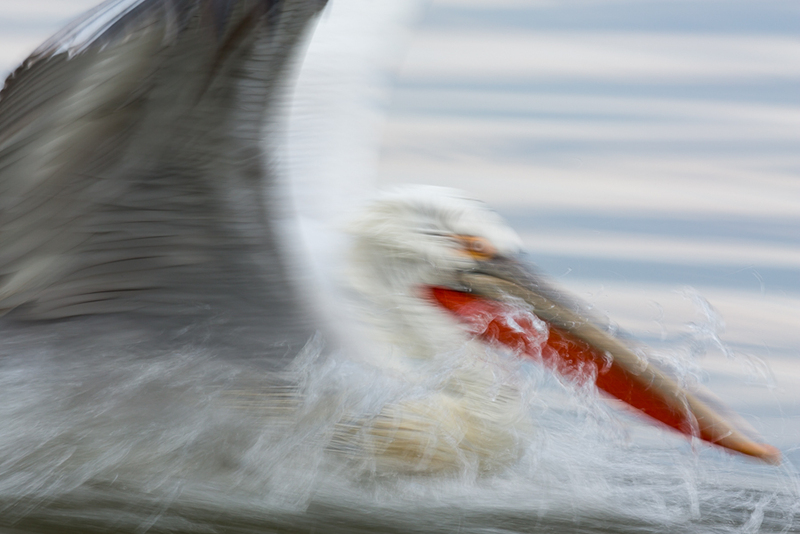 My first encounter with the Dalmatian Pelicans was on Saturday morning. Vasilis took us out onto the lake in an open wooden boat with a roof made by some sort of canvas. Although it rained heavily during most of the boat trip, we were reasonable protected against the rain. 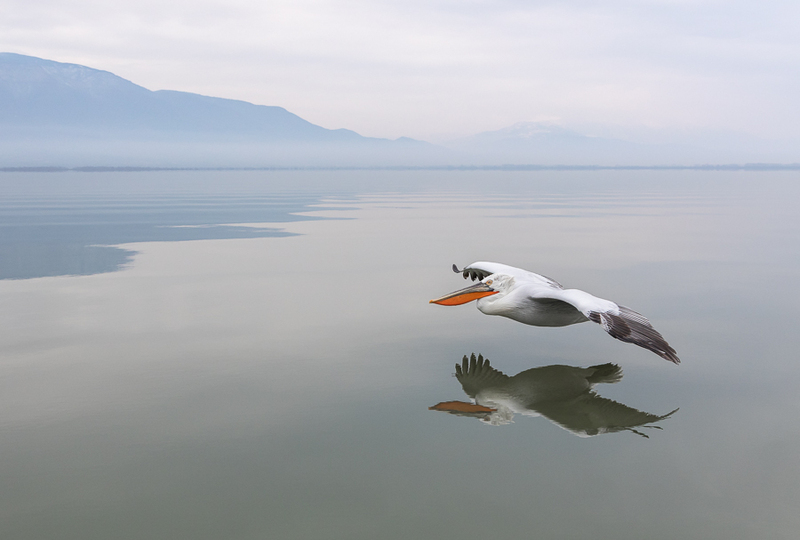 Kerkini Lake is an artificial fresh water reservoir and one of the premier birding sites in Greece. It is about 17 km long and 5 km wide and the water is only 1.5 metres deep on average during winter. We left the harbour of Kerkini just after 7 o'clock and sailed almost an hour before seeing the first pelicans. 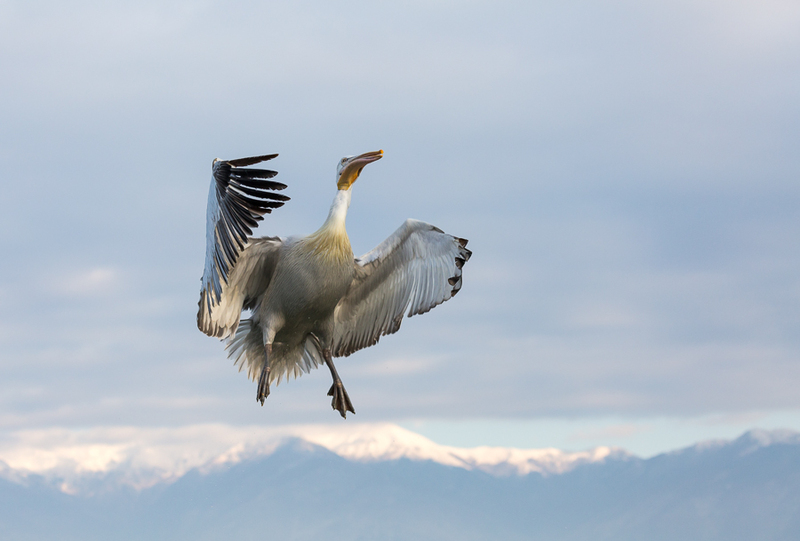 Vasilis threw out fish to bring them close to the boat allowing for flight shots as well as close ups. 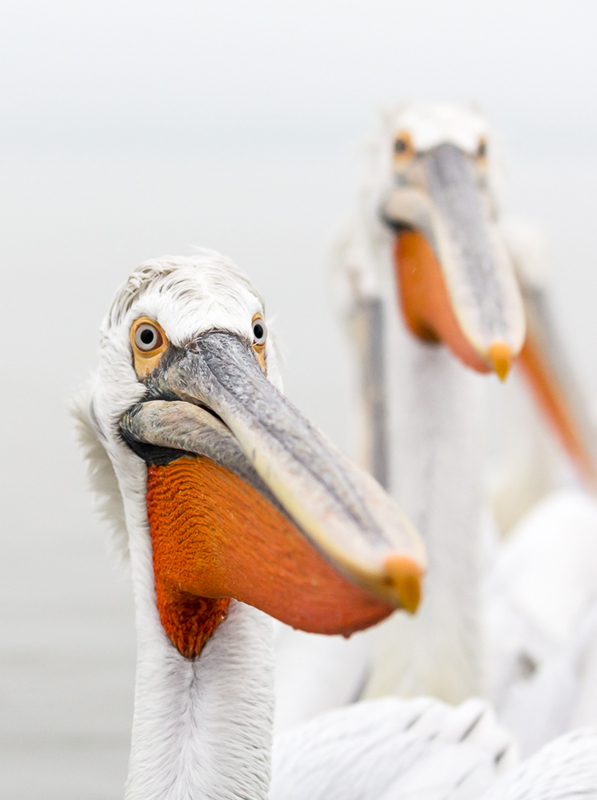 The Dalmatian Pelican is a huge bird. With a wingspan of up to 345 cm and a weight of about 11 kilos, it is actually one of the largest living birds in the world. And they are very photogenic too - many in full breeding plumage this time of year with their intensely red gular pouches. 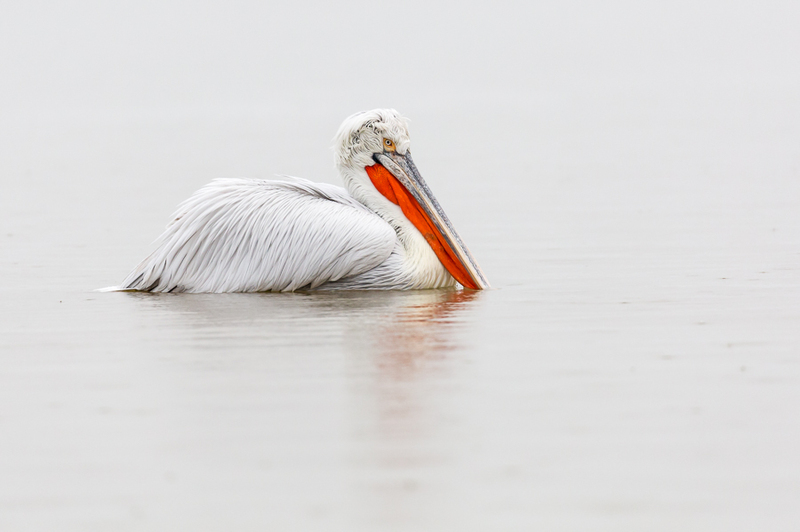 We had some great hours with the pelicans and the hazy and rainy weather was not at all a bad thing as it gave us an opportunity to create atmospheric images against the soft and foggy background. 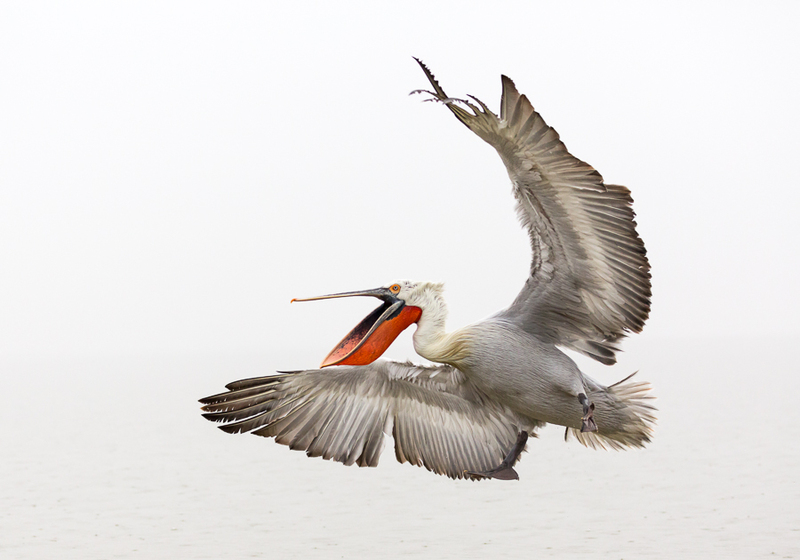 Furthermore, we were able to do flight shots of the Dalmatian Pelicans when they passed the boat to catch the fish. Also, we saw a White Pelican having stayed in Greece this winter when most of its fellow species had left for Africa. 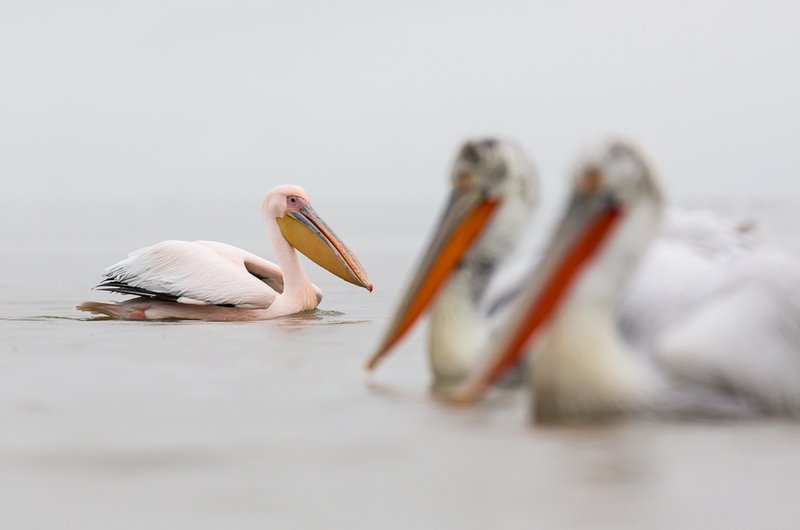 The White Pelican is smaller than the Dalmatians - and pink! 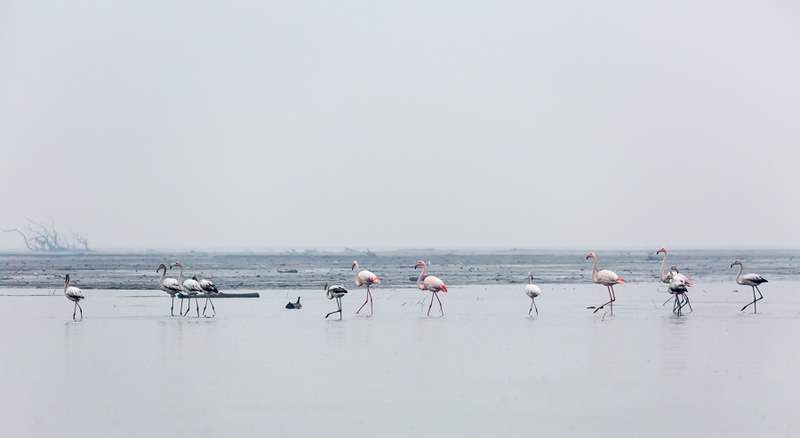 On the way back to Kerkini harbour, Vasilis tried to get close to a group of flamingos in the north-eastern part of the lake. They were in very shallow water so it was risky business. The muddy bottom of the lake was just below the boat and we nearly got stuck. Fortunately, Vasilis managed to get free and despite the long distance to the flamingos, I got a few images. 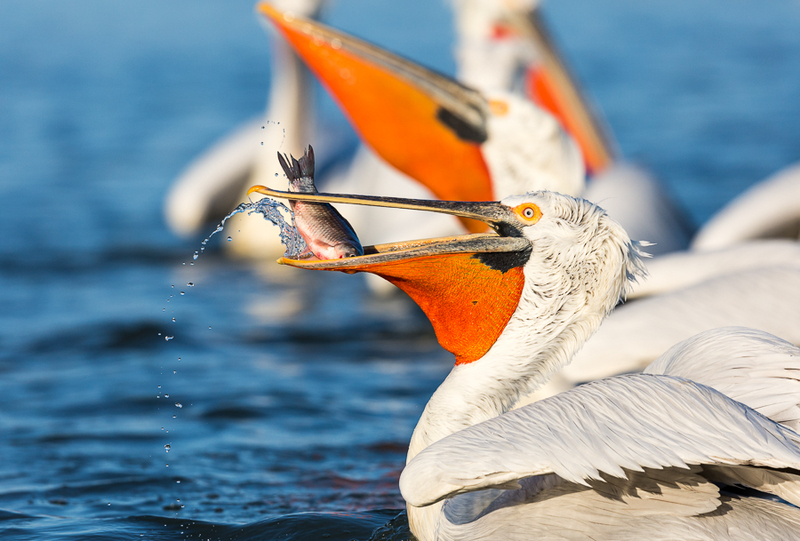 Around noon we were back at the hotel and my first experience with the Dalmatian Pelicans had been rewarding. However, I did hope for some sunny spells in the days to come. In the afternoon we went to the southern part of the lake nearby the dam. Vasilis prepared his old Land Rover with a trailer for our equipment and off we went for half an hour drive through a narrow and winding road. As we arrived at the shoreline only a few pelicans were there. 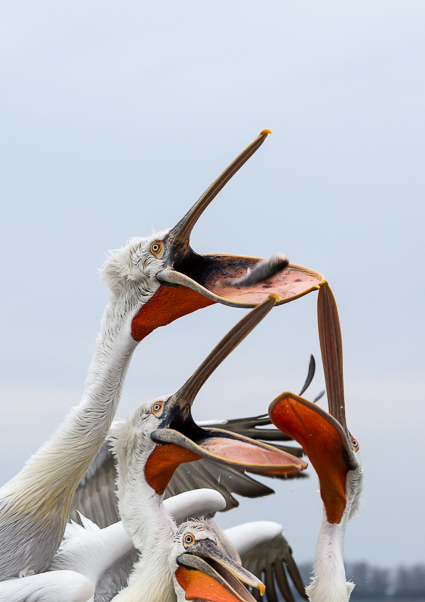 However, as Vasilis took out his basket of fish, more Dalmatian Pelicans came and soon, more than 30 pelicans stood in front of us waiting for dinner. 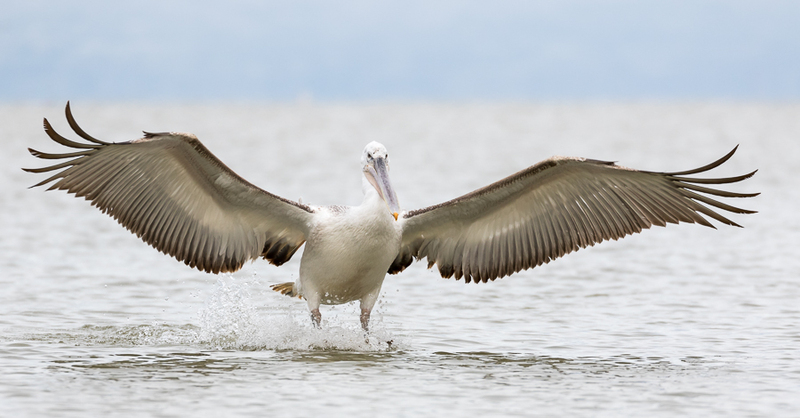 At first, we took images of pelicans flying in and drifting to the shore. Then the big show started! 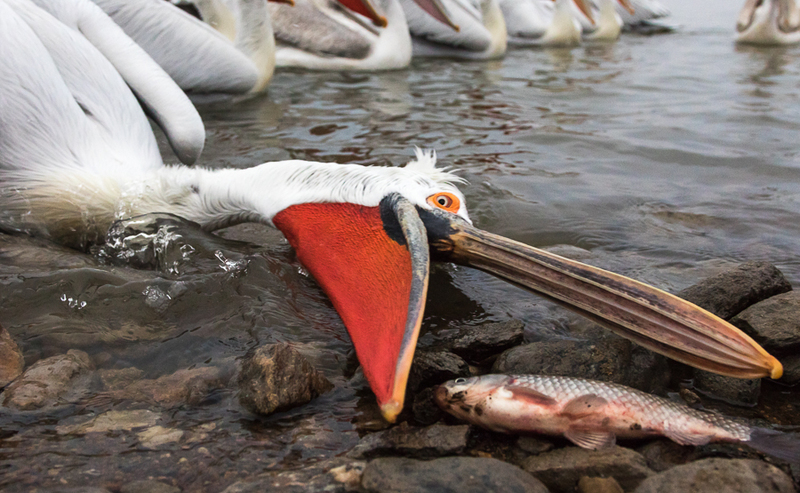 We put on the wide-angle lenses and laid flat on the ground just in front of the many pelicans fighting for the fish served by Vasilis. 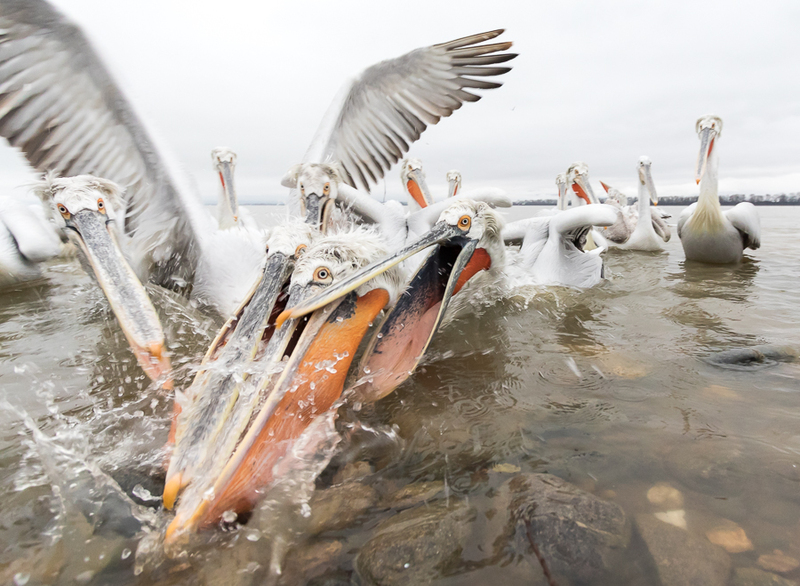 The pelicans will stop at nothing to get a fish and the sceneries were chaotic at times. This was our change to get some spectacular images, but it was not at all easy to predict the reactions of the Dalmatians and get the focusing right. At the same time, it was strenuous lying on the stoned shore to be eye level with the birds. Fortunately, the weather had improved during the afternoon and the rain had almost stopped. 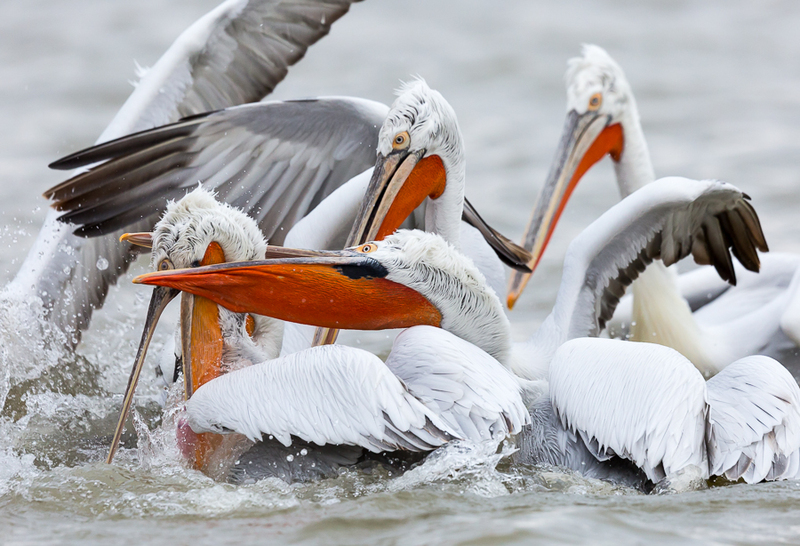 However, that did not prevent us getting wet when the huge pelicans threw themselves after the fish right in front of us. Even worse, the lenses had to be cleaned regularly as the glasses got heavily sprayed. It was great fun though and a couple of hours later we returned to the hotel trusting that we had some fine images on the card. The following days were almost the same being on the lake in the morning and at the shoreline for some hours before sunset. The main difference was the improved weather conditions. As the weather improved and the sun came out we got more colourful images of the Dalmatians with their red pouches against the blue water and sky. But it got cold as well and in order to operate the camera you can only wear thin gloves. Thus, the minus 5-8 degree Celsius was a huge challenge for the fingers. Another change was the departure of David Miles and the group on Monday morning. I joined them for an extra shoreline feed on their way to the airport and returned back to the hotel for lunch and a relaxing afternoon going through the many images from the first couple of days. 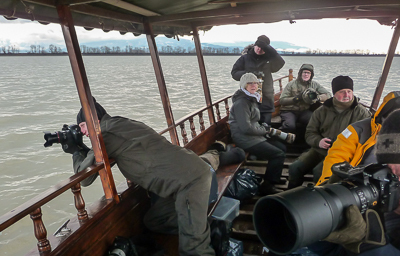 In the afternoon Richard Peters arrived with another group of photographers with whom I enjoyed more great days photographing Dalmatian Pelicans. One morning on the lake, Richard was doing some creative stuff with blurred images using slow shutter speed. I took up the challenge and the below image was my best attempt - obviously, I need more practice! On my last boat trip it was a frost, cold morning at the lake with no wind at all. I noticed a fine reflection in the calm water as a Dalmatian Pelican passed our small boat when on the way back to the harbour. The soft morning light created a pastel-like atmosphere to the scenery with the mountains in the background. The pelican flew by our boat a couple of times before leaving and I managed to get a few shots with a pleasing composition and reflection. On my last day in Kerkini, I was on my own. Vasilis gave me some recommendations on where to go and after breakfast, I drove up to the northern part of Lake Kerkini. I parked the car at the appointed place and continued on foot towards the lake some 4-5 km away. I passed through a wetland area and observed several flamingos and some ducks. Unfortunately, it was difficult to get close to the birds being very shy. After all, I managed to get a few shots of flamingos before returning to the car. 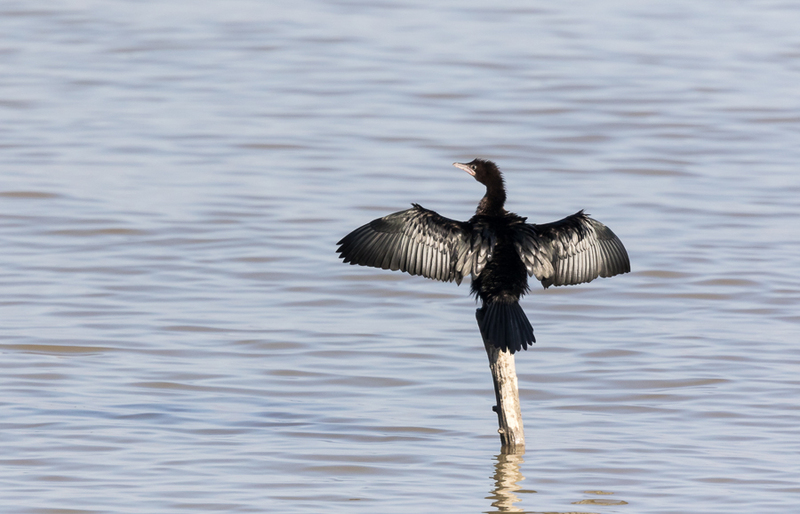 On our boat trips on Lake Kerkini, I had seen some pygmy cormorants sitting on the posts in the harbour of Kerkini. Therefore, I finished my day out trying to photograph the cormorants. The pygmy cormorants turned out to be just as shy as the flamingos and they all flew when I approached. Then, I decided to hide behind a bush and wait for others to arrive. My patience paid off and I got a few images of these black birds perching on the posts and holding their wings out in the sun. It turned out to be an alternative day in Greece without a lot of photo opportunities. On the other hand, I experienced the local area and had a great day on my own. I planned to leave the hotel for the airport early Friday morning at 7 o'clock and said goodbye to all on Thursday evening as the rest of the group had a later flight on Friday afternoon. The hotel was empty and dark when I packed the car. Then, to my big surprise, Vasilis suddenly turned up to make me a cup of coffee and bid farewell. He is a great character and did his utmost to service and support us during the stay. 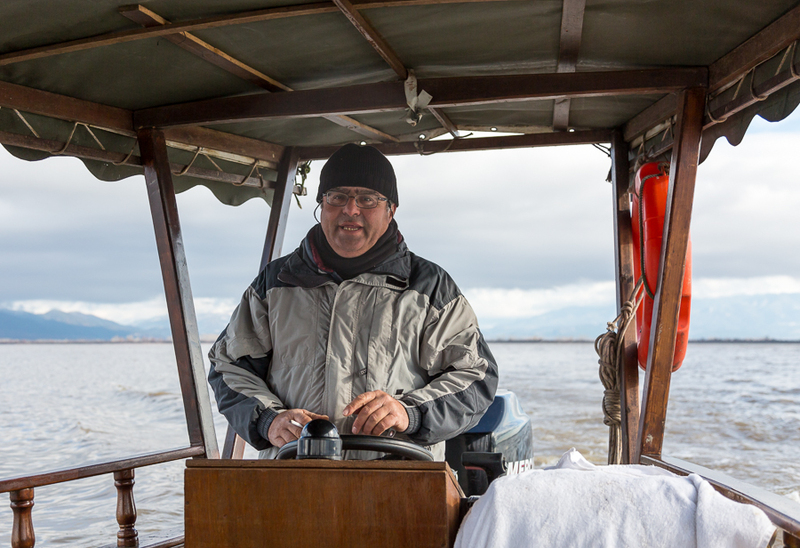 My week-long trip to Lake Kerkini in the northern Greece was a huge success. 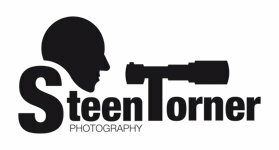 Not only did I return home with plenty of great images, I also enjoyed the fine company of David Miles and Richard Peters along with their groups of friendly photographers. Not to forget my new friend Vasilis! The whole photo holiday was well arranged and I look forward to new adventures with NaturesLens!